Here are two photographs and a series of letters written between members of the Roberson family during World War II and after. The first photograph shows Ivan Glenn Roberson in military uniform. The other shows the Roberson family: front row (left to right) Minnie Lysena, William David, Lottie Jane, Edna and the back row (left to right) Schuyler, Lottie Irene, Wilma Angeline, Tommy, Carl, Violet Juanita, (Ivan), John Dow. 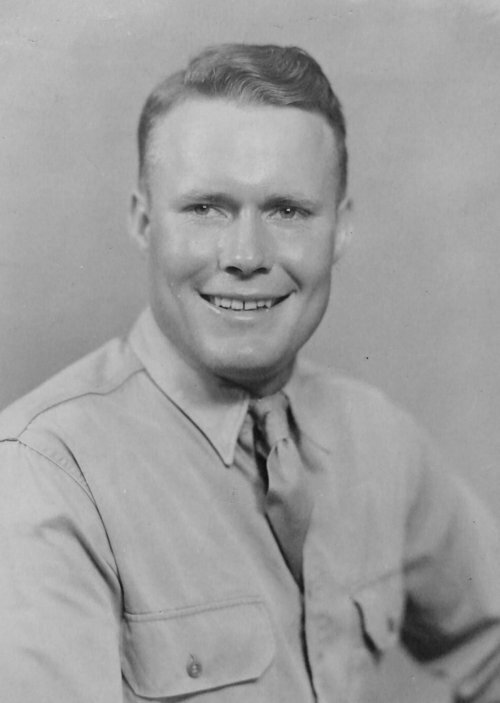 A majority of the letters, transcribed by Ron Roberson, were written between 1941 and 1945; however, there are a few written in 1946, 1947, 1948 and 1975. Many of the letters are written to and by Ivan Roberson who entered active service on October 10, 1941, at Fort Leavenworth, Kansas. He was assigned to the 40th Infantry Division of the United States Army, which had been activated for World War II in March 1941. Ivan appears to have been sent immediately to Camp San Luis Obispo, California, where he was assigned to Battery B of the 222nd Field Artillery Regiment. In April 1942 the division moved to Fort Lewis, Washington. It departed for overseas service in August 1942, and arrived in Hawaii in September of that year where they were assigned to defend the north side of Oahu. They were relieved in October 1943 to begin a period of intensive training. The division left Hawaii for Guadalcanal in January 1944. In April 1944 the division was transferred to the island of New Britain, now part of Papua New Guinea. They were relieved of their duties in November 1944 to begin another period of intense training for the invasion of the Philippines. They sailed from New Britain on December 9, 1944, and reached Luzon, Philippines on January 9, 1945. The division participated in the invasion and remained in the Philippines until September 1945 when it was moved to Korea. It appears that Ivan left the Philippines around the time the division was being transferred to Korea. He was formally separated from the US Army at Fort Logan, Colorado, on October 4, 1945.